When I was traveling in Central America the people there often spoke of having two seasons: wet and dry. And while we have a little more nuance to our seasons here, with the arrival of the recent rain, this could be considered the beginning of our wet season. There’s actually something nice about hiking a trail just after it’s rained. The dust has been washed off, the air is clearer and the land feels renewed. 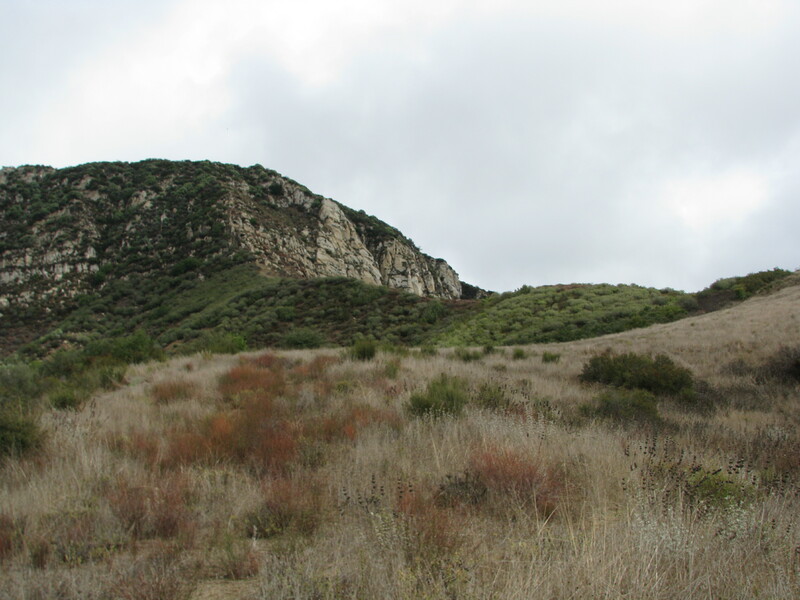 Aliso Canyon is a great hike for beginnings as well as avid hikers as one can either hike the first mile and turn back or continue and take the loop trail, which is about 3.5 miles roundtrip. As a bonus the first mile of the trail includes a series of interpretive signs that details the various native plants and resources that the Chumash utilized in their daily life. The trailhead is about 30 minutes from Santa Barbara. To get there take Highway 154 to Paradise Rd. and then left at Los Prietos Ranger Station. This is also the turn off for Sage Hill campground. The trailhead is at the far end of Sage Hill campground. You will need an adventure pass, which one can get at the ranger station or by continuing a short ways on Paradise Rd. to the kiosk where they sell them, and then doubling back. The trail itself is in great condition and is easy to follow. The first mile is quite magical as it follows the creek and passes through a rich variety of native plants including oak, toyon and sycamore. The experience is only enhanced by the interpretive signs, which talk about the use of these different plants. At the one-mile mark the interpretive signs end and trail climbs out of the canyon. From here it’s roughly a half-mile to the saddle between Aliso and Oso Canyons. Perhaps because this part of the trail is the least used it feels the most peaceful, in spite of the raucous noise from the many scrub jays that call it home. From the saddle one can see Upper Oso campground and the surrounding valleys. The Aliso Loop trail continues along the ridgeline towards the Santa Ynez River and offers some great views of both Little Pine Mountain behind you and then the Santa Ynez River where the trail begins its return to Sage Hill. This for me was one of the highlights with the cottonwood trees starting to turn gold and the river with recent rain a rich blue the view was incredible. From here the trail begins its descent and rejoins the canyon trail about a quarter mile before the parking lot. If you have a little extra time you may also want to wander down the Santa Ynez River. In the fall one often comes across mule deer feeding along the river. I originally had a different hike in mind for the first article, but when the news-press finally gave me the green light for the column, Aliso Canyon seemed like the right choice. I got lucky on the photos while I was out there. 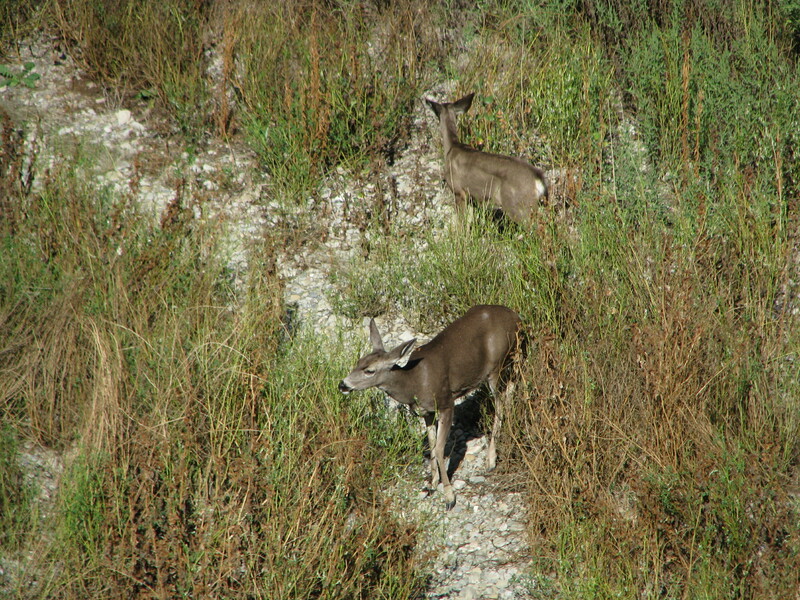 Mostly on a whim, I pulled off the road near the ranger station overlooking the Santa Ynez River to take in the view and just happened to notice two black-tailed deer browsing in the dry riverbed below. Because of my vantage they didn’t seem to notice me and I was able to get a lot of great shots of the deer. Later in the hike, while resting at the small saddle between Aliso and Oso Canyons I noticed this scrub jay flying back and forth between these two different bushes and positioned myself to be able to get a good shot of it on one them without disrupting its pattern. Although this was the first article of mine published in the news-press, it was not the first article that I wrote for them. In September 2010, while in discussion with the paper about the idea of having a hiking column, the editor asked me to submit a sample article (below). It was right before Labor Day Weekend, so on Saturday I headed out to Forbush Flats, which is one of my favorite close to home backcountry hikes, and hiked the trail down the Santa Ynez River. When I got to the trailhead I realized I’d made a rookie mistake of having the original memory card in my camera, which is only good for about 10 pictures, instead of my regular 8GB card (which I’ve yet to fill up on a single trip). Rather than go back to my house, I just decided to be judicious in the pictures I took, even deleting pictures on the hike to make space for new ones. The next day I wrote the article and submitted it to the editor. It took them until November to make the column official. I had a different working title for the column when I wrote the sample article and later changed it to Trail Quest. Forbush Flats is probably one of my favorite Santa Barbara day hikes. The trail is only 30 minutes from Santa Barbara but has a decidedly back country feel. On past trips I have seen mountain lion and bobcat and one summer found a series a bear tracks that gave the impression that the bear had come up from the Santa Ynez River to have a look around. What adds to this sense of being in the rugged outdoors is that few people visit this trail in comparison to the front country trails. Forbush Flats is reached from the Santa Barbara foothills by driving up Gibraltar Road and then turning right on to East Camino Cielo. In fact, this part of the trip is half the fun, as there are literally a dozen places where you can pull off the road and on one side gaze at the expansiveness of the Los Padres National Forest and on the other side at the beauty of our coastal setting and the Channel Islands. And now in the aftermath of our recent forest fires one can also see the amazing amount of regrowth that has taken place. You’ll know that you’ve reached the trail head as it’s the first turnoff you’ll see on the right hand side that has room for a number of cars and above it a large cement water tower on the hill. This is also where the Cold Springs Trail from Santa Barbara meets Camino Cielo and so you’ll often see people cresting the top after their hike up. Today, I was greeted by a couple needing extra water for their hike back down. From here our hike begins. The best time go this time of year is in the morning or late afternoon to avoid as much of the heat and flies as possible. Naturally, I got a late start and hit the trail at 12:30pm. It is a fairly easy descent down the backside of the Santa Ynez Mountains. The trail threads its way through the chaparral and although overgrown in some spots is easy to follow. Here in the late summer the plants that stand out are chamise with its dry flowers giving the hillside and tinge of rust color and wild cherry or islay as the Spanish call it. 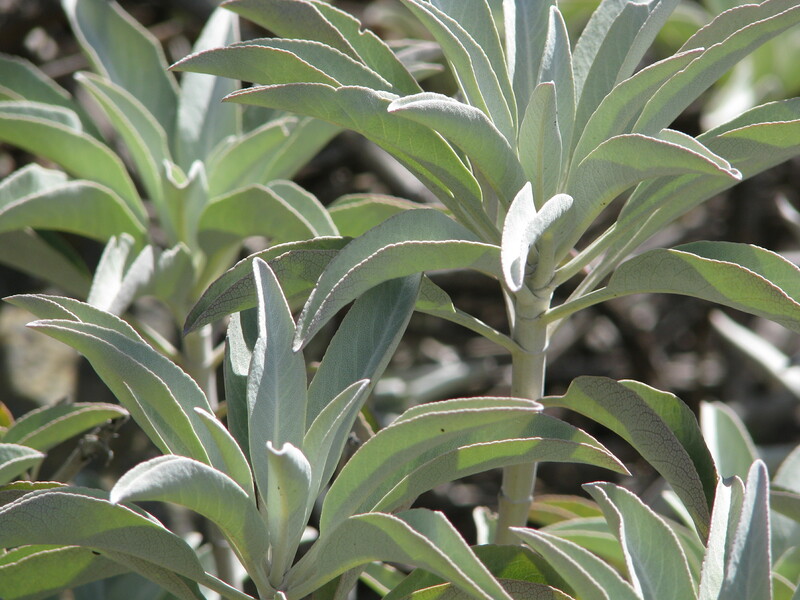 Other recognizable plants include scrub oak, manzanita, and bay laurel. There is not much poison oak on the trail. The trail itself is about 1.75 miles and offers some great views of Blue Canyon and the giant meadow now gold in color where Cottam Camp is situated. Just as I arrived at Forbush I smelled smoke and imagined that I would see campers in one of the two campsites there. Instead, I found the remains of their fire still smoldering. Sad because there was both a shovel there provided by the forest service, a trickle of water in the creek nearby, and a fire ban throughout the Los Padres National Forest except for within developed recreation areas such as those along Paradise Rd. Forbush Flats, was named after Frederick Washington Forbush, who was a homesteader. He built a cabin there in 1910, and planted olive, apple, and pear trees. Of which, the pear and olive trees still remain. In fact, this time of year the pear trees were loaded with ripening pears. In years past in the early spring I’ve seen the trees lit up with pear blossoms. Both are quite a sight in the backcountry. Both campsites have a picnic table and grated stove. The first campsite is under a large oak tree and also has the remnants of an ice stove, a sight that is becoming rarer and rarer. The second camp, just past the fruit trees is near several large pine trees and both camps are along the creek. The creek itself usually only has running water in the spring. Forbush is great place to rest or even camp overnight. And the hike out isn’t too bad. For the more adventuresome from Forbush there are two options for extending your hike. One is to hike down Forbush Canyon and visit Cottam Camp (about 7.5 miles round trip from the road and back). The other is to continue over the small ridge across from Forbush and hike down to the Santa Ynez River (about 7 miles round trip). This time around I opted to hike down to the River, curious if there would be water and convincing myself that there might be a couple of swim holes along the way to cool off in. The trail from Forbush to the Santa Ynez River is definitely steeper and offers some great views of the Mono basin with its dense forest of Cottonwood trees. About halfway down water did start to appear in the creek, isolated patches at first and then pools connected by a small trickle. The water was both surprising clear in areas as well as surprisingly cold. Near one pool I caught a small turtle who seemed pretty feisty for a turtle and so I put him in the water and watched him swim off. In all, I spotted four turtles along the trail. It’s also in this part of the trail that one comes across a cool little waterfall with a pool at the top and its own series of cascades as the water flows over the dense build up of mineral deposits. In the spring with a good rain it’s quite impressive. This time around it was covered with wild flowers. It’s also shortly after this point that one comes to the only intersection along the trail. To the left, the trail leads to the Sunbird Quicksilver Mine, Gibraltar Reservoir, and ultimately Red Rock. To the right, the trail continues down to the Santa Ynez River. Eventually, I reached the river, which was dry as one might expect this time of year. However, I did see two mule deer in the dry riverbed, who were probably grateful that I was not a hunter as deer season had opened two weeks earlier. This part of the trail is also a great place to hunt for shell fossils; and when the river’s dry, to look for animal tracks in the riverbed. Usually there are deer, coyote, mountain lion, and bear tracks to be found. From here the trail crosses the river and continues towards Mono Camp. On the hike out a stop for a soak in one of the pools is a must to beat the heat and make the trip all worthwhile. In fact, it’s amazing how hard it is to get out of the water knowing that one has a hike uphill in the heat. Fortunately a breeze started to pick up and by late afternoon much of the trail was in the shade. I arrived at my car around 6:00pm just as two backpackers were hitting the trail to spend the night at Forbush under the stars.